Olopatadine hydrochloride is an antihistamine (as well as anticholinergic and mast cell stabilizer), sold as a prescription eye drop(0.2% solution, Pataday (or Patanol S in some countries), manufactured by Alcon). It is used to treat itching associated with allergicconjunctivitis (eye allergies). Olopatadine hydrochloride 0.1% is sold as Patanol (or Opatanol in some countries). A decongestantnasal spray formulation is sold as Patanase, which was approved by the FDA on April 15, 2008. It is also available as an oral tablet in Japan under the tradename Allelock, manufactured by Kyowa Hakko Kogyo. 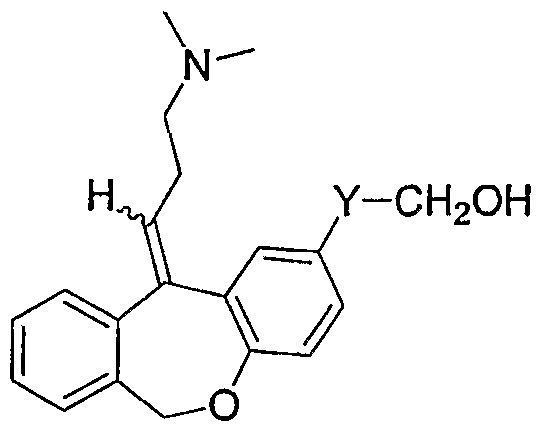 Olopatadine free base is specifically described in U.S. Patent No. 5,116,863. 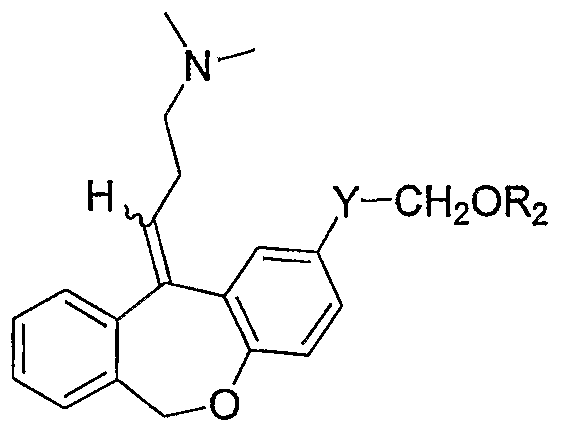 This U.S. patent does not provide any example describing the preparation of olopatadine hydrochloride. It is believed that the preparation of olopatadine hydrochloride was first disclosed in J. Med. Chem. 1992, 35, 2074-2084. The syntheses of several corresponding tricyclic derivatives are disclosed in the same manner in EP 0214779, in which the Grignard addition (analogous to Scheme 1) and the Wittig reaction (analogous to Scheme 3) are described as key reactions. A significant disadvantage of the synthetic route depicted in Scheme 4 is the diastereoselectivity of the dehydration step, which gives up to 90% of the undesired E-isomer. 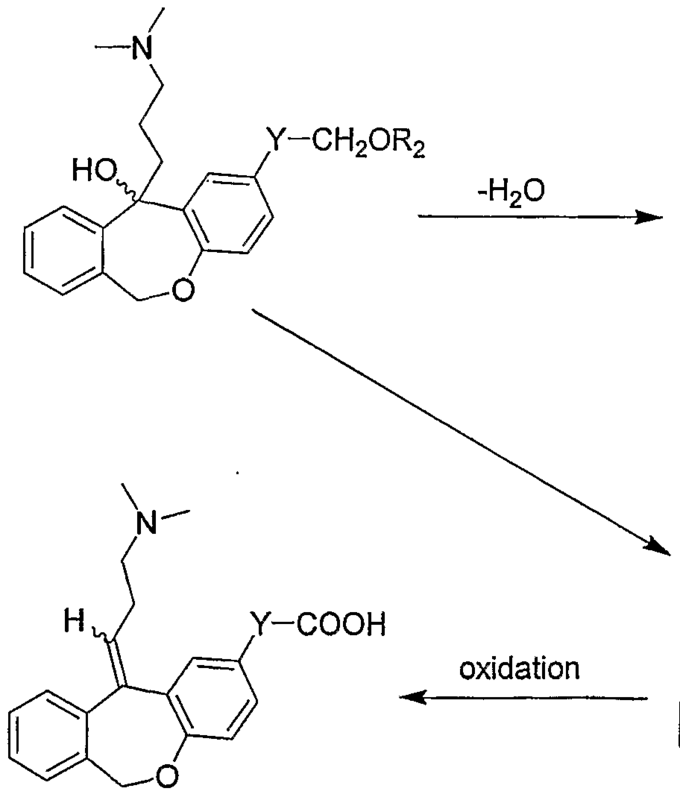 The last step (oxidation) is not described in this publication.Scheme 5 below depicts a prior art method disclosed in Ohshima, E., et al., supra. 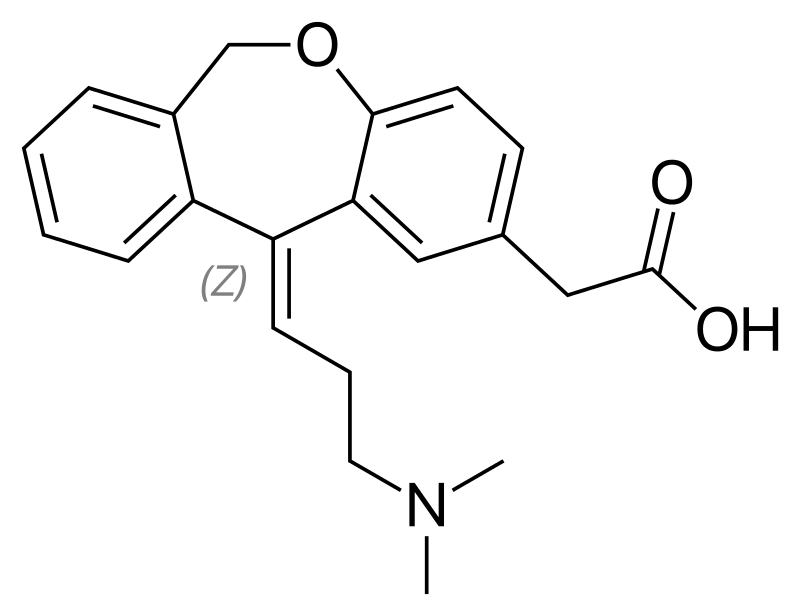 (8) the overall yield of the olopatadine, including the separation of the diastereomers, is only approximately 24%, and the volume yield is less than 1%. As noted above, the known methods for preparing olopatadine in a Wittig reaction use the intermediate compounds 6,11-dihydro-l l-oxo-dibenz[b,e]oxepin-2-acetic acid and 3- dimethylaminopropyltriphenylphosphonium bromide hydrobromide. 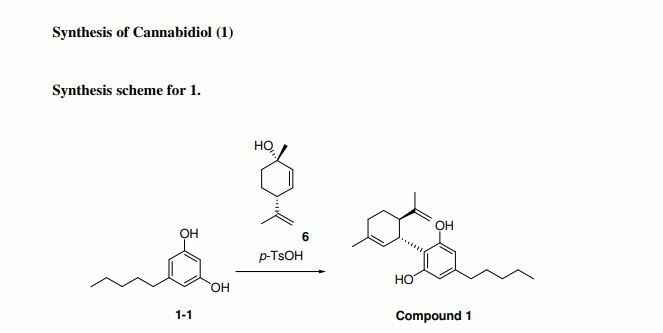 Preparation of these chemical intermediates by prior art syntheses present a number of drawbacks that add to the cost and complexity of synthesizing olopatadine. 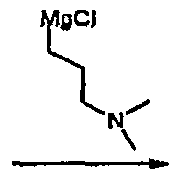 acidFurther, as depicted in Scheme 9, below, U.S. Patent Nos. 4,118,401; 4,175,209; and 4, 160,781 disclose another method for the synthesis of 6, 11 -dihydro- 11 -oxo-dibenz[b,e]oxepin-2- acetic acid. JP 07002733 also describes the preparation of 6,11 -dihydro- 1 l-oxo-dibenz[b,e]oxepin-2- acetic acid, as follows in Scheme 10, below. 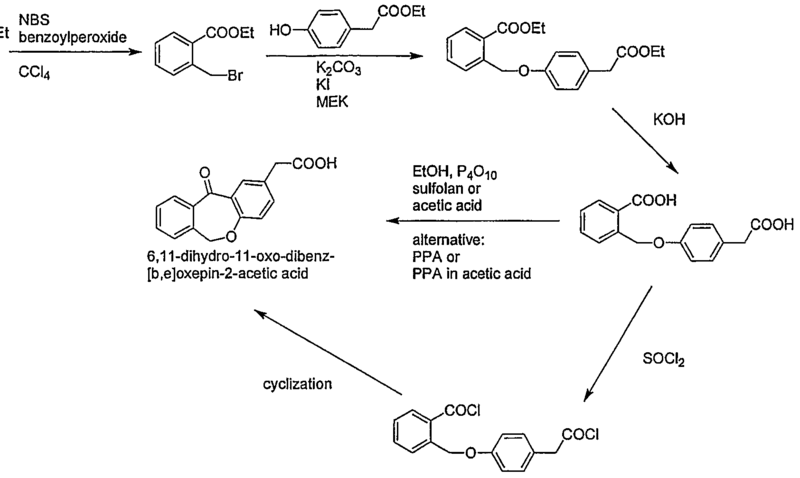 acidSpecific methods and reagents for performing the intramolecular Friedel-Crafts reaction for cyclizing 4-(2-carboxybenzyloxy)-phenylacetic acid to form 6,11 -dihydro-11-oxo- dibenz[b,e]oxepin-2-acetic acid are described in (1) EP 0068370 and DE 3125374 (cyclizations were carried out at reflux with acetyl chloride or acetic anhydride in the presence of phosphoric acid, in toluene, xylene or acetic anhydride as solvent); (2) EP 0069810 and US 4282365 (cyclizations were carried out at 70-80° C with trifluoroacetic anhydride in a pressure bottle); and (3) EP 0235796; US 5,116,863 (cyclizations were carried out with trifluoroacetic anhydride in the presence of BF3 »OEt2 and in methylene chloride as solvent). According to the teachings in EP 0235795, a suspension of 3- bromopropyltriphenylphosphonium bromide (Olo-IM4) in ethanol was reacted with 13.5 equivalents of an aqueous dimethylamine solution (50%) to provide dimethylaminopropyltriphenylphosphonium bromide HBr. After this reaction, the solvent was distilled off and the residue was recrystallized (yield: 59%). U.S. Patent No. 3,354,155 describes a reaction of 3-bromopropyltriphenylphosponium bromide with 4.5 equivalents dimethylamine. The solution was concentrated and the residue was suspended in ethanol, evaporated and taken up in ethanol again. Gaseous hydrogen bromide was passed into the solution until the mixture was acidic. After filtration, the solution was concentrated, whereupon the product crystallized (yield of crude product: 85%). The crude product was recrystallized from ethanol. A significant disadvantage of the prior art processes for making 3- dimethylaminopropyltriphenylphosphonium bromide hydrobromide involves the need for time consuming steps to remove excess dimethylamine, because such excess dimethylamine prevents crystallization of the reaction product. Thus, to obtain crystallization, the prior art processes require, for example, repeated evaporation of the reaction mixture (until dryness), which is undesirable for a commercial scale synthesis of olopatadine. Corey, EJ., et al., Tetrahedron Letters, Vol. 26, No. 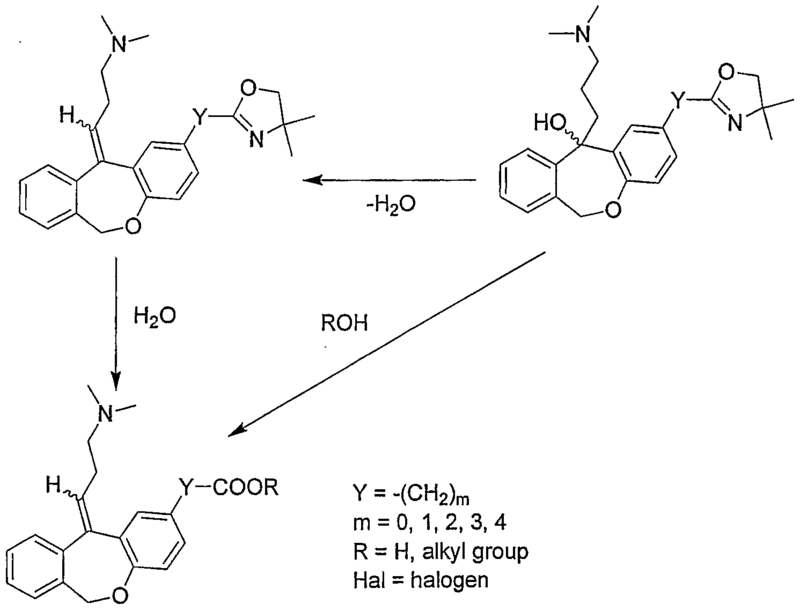 47, 5747-5748 (1985) describes the preparation of 3-dimethylaminopropyltriphenylphosphonium bromide (free base) from its corresponding hydrobromide salt. But the preparation of the free base, which uses an extraction step with methylene chloride as the solvent, is undesirable for commercial production because of the poor solubility of the free base in many of the organic solvents that are desirable for commercial production of chemical products, and because of the high solubility of the free base in water, causing low volume yields and loss of material. Furthermore according to this publication, the work up procedure gave an oil, which crystallized only after repeated evaporation in toluene. Olopatadine and pharmaceutically acceptable salts thereof are described in patents EP 214779 , US 4871865 , EP 235796 andUS 5116863 . 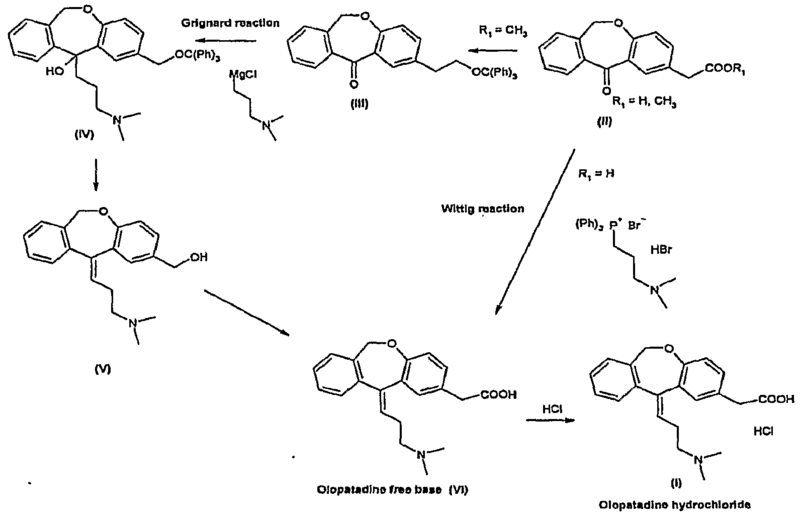 Patent EP 214779 describes two general processes for the production of Olopatadine, one of them involving a Wittig reaction and the other a Grignard reaction followed by a dehydration step. 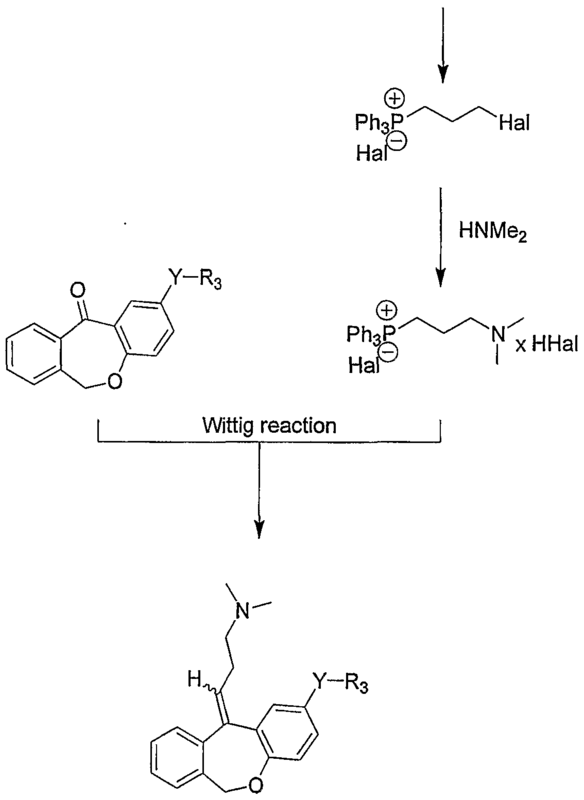 Patent US 5116863 describes the production of Olopatadine hydrochloride by several different processes, two of which include a Grignard reaction for introducing the side chain in position 11 and a third process (called “Process C” in said patent) in which said side chain is introduced in position 11 by means of a Wittig reaction. In a specific embodiment (Example 9), the Wittig reaction is performed on the 6,11-dihydro-11-oxodibenz[b,e]oxepin-2-acetic acid (3) substrate, also known as Isoxepac, which is reacted with (3-dimethylaminopropyl)-triphenylphosphonium bromide hydrobromide, in the presence of n-butyl lithium giving rise to a Z/E mixture of Olopatadine together with salts of phosphorus which, after purifying by means of transforming it into the methyl ester of Olopatadine (2) and subsequent hydrolysis, provides Olopatadine hydrochloride (1), as shown in reaction scheme 1. In the process shown in reaction scheme 1, the Wittig reagent [(Ph)3P+(CH2)3N(Me)2Br–HBr] is used in excess of up to 5 equivalents per equivalent of Isoxepac (3), a dangerous reagent (n-butyl lithium) is used; the process is very long and includes a number of extractions, changes of pH, in addition to esterification and subsequent saponification, the process therefore having very low yields and being rather expensive. The Z/E isomer ratio obtained in said process is not described. Ohshima E., et al., in J. Med. 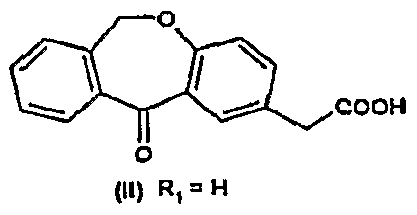 Chem., 1992, 35:2074-2084 (designated inventors in US 5116863 ) describe several methods for synthesizing Olopatadine hydrochloride and other compounds of similar structure by means of Grignard reactions in some cases, and by means of Wittig reactions in other cases, for introducing the side chain (3-dimethylaminopropylidene). Following the synthetic scheme shown in reaction scheme 1, they start from type (3) compounds with free carboxylic acid and use (i) as base, n-butyl lithium, in a ratio relative to the type (3) compound of 7.5 equivalents of base/equivalent of type (3) compound and (ii) as Wittig reagent, (3-dimethylaminopropyl)-triphenylphosphonium bromide hydrobromide, in a ratio relative to the type (3) compound of 4.9 equivalents of the Wittig reagent/equivalent of type (3) compound. 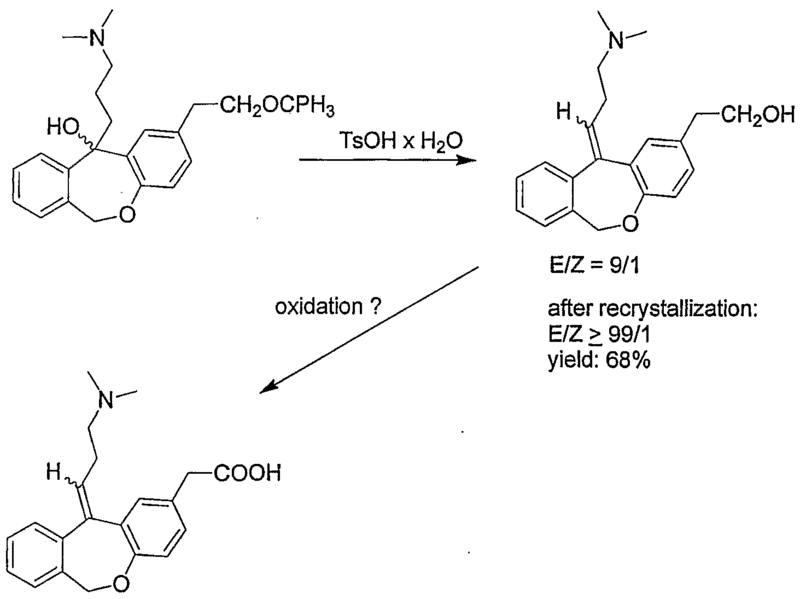 Once the Wittig reaction is carried out, in order to be able to better isolate the products, the acid is subsequently esterified; thus, and after purification by means of column chromatography, the obtained Z/E isomer ratio is 2:1. In said article, the authors (page 2077) acknowledge that when they try to perform this same Wittig reaction starting from a type (3) compound having an ester group instead of a carboxylic acid, the reaction does not occur and the starting material is recovered without reacting. This process has several drawbacks since it needs large amounts both of the Wittig reagent and of the base, n-butyl lithium (dangerous reagent, as already mentioned), it needs esterification, column purification, saponification and purification again, whereby the global process is not efficient. 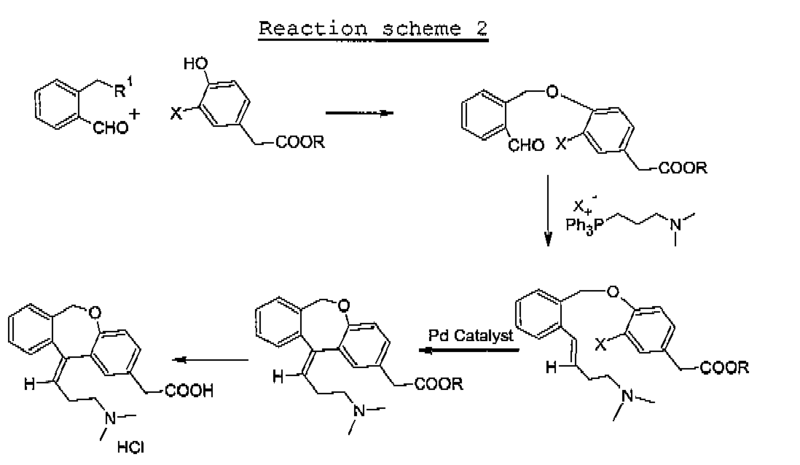 Application WO 2006/010459 describes obtaining Olopatadine hydrochloride by means of a process in which a Wittig reaction is also performed but, this time, on an open substrate with final cyclization to form oxepin by means of Pd catalyst as can be seen in reaction scheme 2. 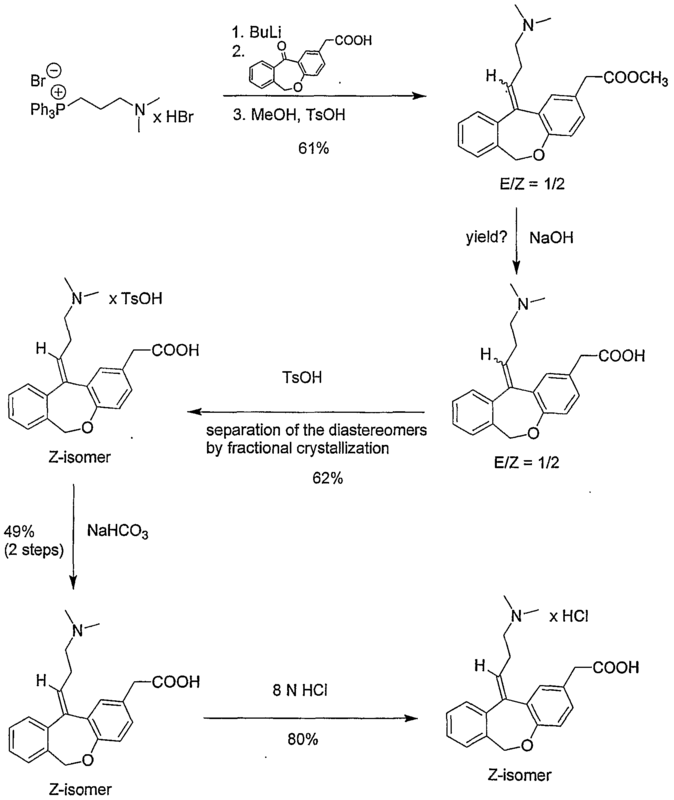 The process shown in reaction scheme 2 has several drawbacks: high number of synthesis steps, the use of palladium catalysts which increase the cost of the process, the obtained Z/E isomer ratio is only 2.5:1 in favor of the Z isomer, and, finally, the need of using ionic exchange resins and chromatography columns, together with the use of dangerous reagents such as lithium aluminium hydride, n-butyl lithium or Jones reagent, make the process unfeasible on an industrial scale. Application US2007/0232814 describes obtaining Olopatadine hydrochloride by means of a process which includes a Wittig reaction between Isoxepac (3) and the corresponding Wittig reagent [(3-dimethylaminopropyl)-triphenylphosphonium halides or salts thereof], using as base sodium hydride (NaH), whereby obtaining Olopatadine base which, after subsequent formation of an addition salt (essential for the production and isolation of the product of interest) and purification, yields Olopatadine hydrochloride (1), as shown in reaction scheme 3. In the process shown in scheme 3, the amounts of Wittig reagent and of base used are very high since when the Wittig reagent is used in the form of salt 2.7 equivalents and 8.1 equivalents of base (NaH) are used, whereas if the free Wittig reagent is used 2.7 equivalents and 4.0 equivalents of base (NaH) are used. In these conditions, the reaction is very long (it can last more than one day) and the obtained Z/E isomer ratio is only 2.3:1, which results in a relatively low final yield and makes subsequent purification necessary. This process is, in addition, slow and tedious, therefore it is not very attractive from the industrial point of view. 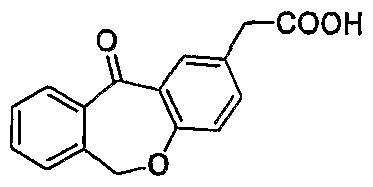 21.49 g (0.050 moles) of (3-dimethylaminopropyl)-triphenylphosphine bromide were suspended in 80 ml of tetrahydrofuran (THF) in a reaction flask under a N2 stream. 1.86 g (0.046 moles) of 60% NaH were carefully added, maintaining the obtained suspension at 20-25°C. Then, 10 ml of dimethylacetamide were slowly added to the previous suspension. The resulting mixture was heated at 35-40°C for 1 hour. At the end of this time period, 10 g (0.031 moles) of 6,11-dihydro-11-oxodibenz[b,e]oxepin-2-ethyl acetate dissolved in 30 ml of THF were added dropwise to the previous solution. The reaction mixture obtained was maintained at 35-40°C for 2 hours. After this time period, the reaction mixture was left to cool to a temperature lower than 10°C, then adding 150 ml of water on the reaction mixture. The solvent was eliminated by means of distillation under reduced pressure until obtaining an aqueous residue on which 100 ml of toluene were added. Subsequently, the organic and aqueous phases were decanted and separated. The organic phase was washed with concentrated HCl (2×50 ml). Then, the organic and aqueous phases were decanted and separated. The obtained aqueous phases were pooled and 100 ml of toluene and 2×10 ml of a solution of 20% Na2CO3 were added to them. The organic and aqueous phases were decanted and separated and the organic phase was concentrated under reduced pressure until obtaining a residue which was used without purifying in Part B. 1H-NMR (CDCl3, 400 MHz), δ: 1.24 (t, 3H), 2.80 (s, 6H), 2.89 (m, 2H), 3.20 (m, 2H), 3.51 (s, 2H), 4.11 (m, 2H), 5.15 (bs, 2H), 5.63 (t, 1H), 6.82 (d, 1H), 7.04 (m, 2H), 7.25 (m, 4H) ppm. 13C-NMR (CDCl3, 400 MHz), δ: 14.41; 25.03; 40.12; 43.14; 57.33; 61.16; 70.93; 120.34; 123.95: 125.44; 126.34; 126.63; 127.72; 128.27; 129.33; 130.85; 131.64; 133.66; 143.74; 144.12; 154.96; 163.34; 172.27 ppm. 1H-NMR (DMSO, 400MHz), δ: 2.69 (s, 6H); 2.77 (m, 2H); 3.24 (m, 2H): 3.56 (s, 2H); 5.15 (bs, 2H); 5.62 (t, 1H); 6.76 (d, 1H); 7.06 (m, 2H); 7.30 (m, 4H) ppm. 13C-NMR (DMSO, 400MHz), δ: 25.12; 40.13; 42.44(2); 56.02; 70.26; 119.95; 123.43; 126.62; 127.64; 128.03; 128.47(2); 129.85; 131.34; 132.57; 134.12; 141.63; 145.25; 154.52; 173.67 ppm. Literature References: Dual acting histamine H1-receptor antagonist and mast cell stabilizer. 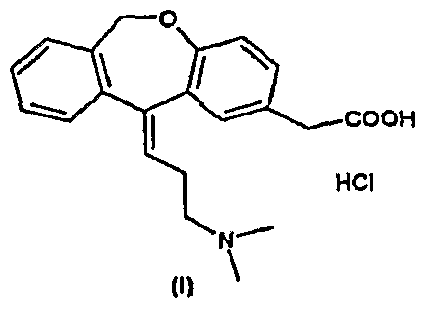 Prepn: E. Oshima et al., EP235796; eidem, US 5116863 (1987, 1992 both to Kyowa); eidem, J. Med. Chem. 35, 2074 (1992). Pharmacology: C. Kamei et al.,Arzneim.-Forsch. 45, 1005 (1995); J. M. Yanni et al., J. Ocul. Pharmacol. Ther. 12, 389 (1996). 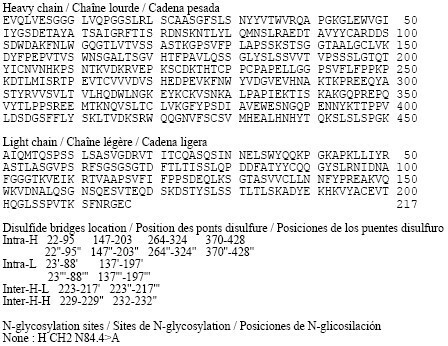 Receptor binding profile: N. A. Sharif et al., J. Pharmacol. Exp. Ther. 278, 1252 (1996). Clinical trial in allergic conjunctivitis: M. B. Abelson, L. Spitalny, Am. J. Ophthalmol. 125, 797 (1998). Properties: Crystallized as the hemihydrate from 2-propanol + water, mp 188-189.5°. Properties: Crystals from acetone-water, mp 248° (dec). Sol in water. Kyowa Hakko Kogyo Co., Ltd. (2007). “ALLELOCK Tablets 2.5 & ALLELOCK Tablets 5 (English)” (PDF). Retrieved2008-08-10. Tamura T, Matsubara M, Hasegawa K, Ohmori K, Karasawa A. (2005). “Olopatadine hydrochloride suppresses the rebound phenomenon after discontinuation of treatment with a topical steroid in mice with chronic contact hypersensitivity.”. Kyowa Hakko Kogyo Co., Ltd. (2002). “Company History”.Company Information. Kyowa Hakko Kogyo Co., Ltd. Retrieved16 September 2010. Ueno, K.; Kubo, S.; Tagawa, H.; Yoshioka, T.; Tsukada, W.; Tsubokawa, M.; Kojima, H.; Kasahara, A. (1976). “6,11-Dihydro-11-oxodibenz[b,e]oxepinacetic acids with potent antiinflammatory activity”. Journal of Medicinal Chemistry 19 (7): 941.doi:10.1021/jm00229a017.